The Upward Mobility program provides opportunities for women to become more resilient and career ready while being connected to training, education and networking opportunities for a self-sufficient and upwardly mobile career track. The program includes at least a 6 month commitment in order for participants to complete a personalized pathway through Fresh Start services, which will include a number of valuable personal and professional growth opportunities. What Can You Expect as an Upward Mobility participant? How Can You Join the Upward Mobility Program? Register as a Fresh Start client and attend the "First Steps" workshop by the application deadline. Attend an Upward Mobility Information session within the past 4 months. Compete every section of the Upward Mobility appilcation, complete essay questions and upload all required documents by application deadline. Scholarships for the Upward Mobility program are available via the E. Jean Goulet Upward Mobility Scholarship. In order to be eligible for the scholarship, you must be enrolled in the Upward Mobility Program. For more information please register for an Upward Mobility Info session – register online today. 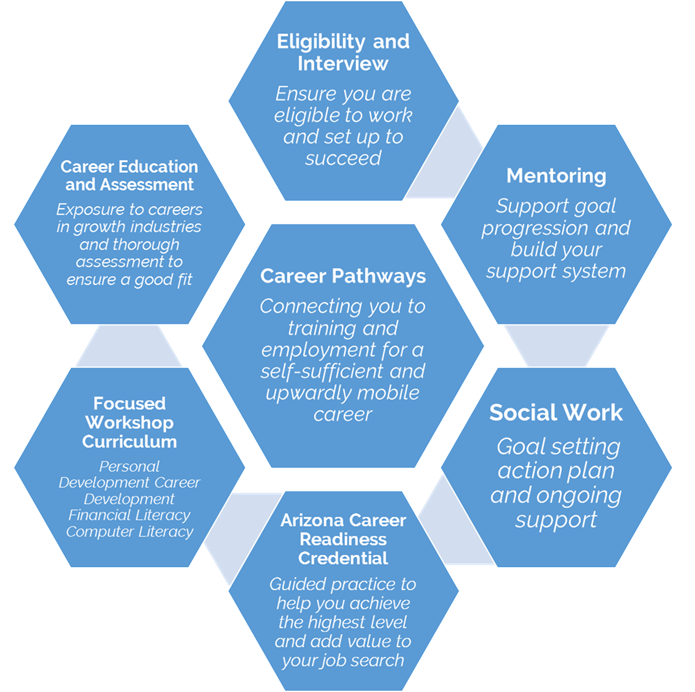 Get the ACRC (Arizona Career Readiness Credential) and see how you can use it to take your career to the next level.